I FIND it strange when I find out someone does not know there is a new Harry Potter film coming out this month. "But there were only seven books” is the common reply. True Harry Potter fans, such as myself, will know Fantastic Beasts and Where to Find Them is not a direct prequel to the Harry Potter saga. It is set in the same universe, but is a completely new story. Fans have found themselves in a unique position. All eight Harry Potter movies came out after the books and so we are mostly in the dark in regard to this new series. What we know for sure, based on the trailers, is that the first film is based on a book JK Rowling released in 2001 under the name of fictitious author Newt Scamander. Scamander is a magizoologist (an expert in magical creatures) and the author of the textbook Fantastic Beasts and Where to Find Them. The book is actually referenced as one of the textbooks Harry Potter owns during the first novel and was released to raise funds for the charity Comic Relief along with a book called Quidditch Through the Ages. 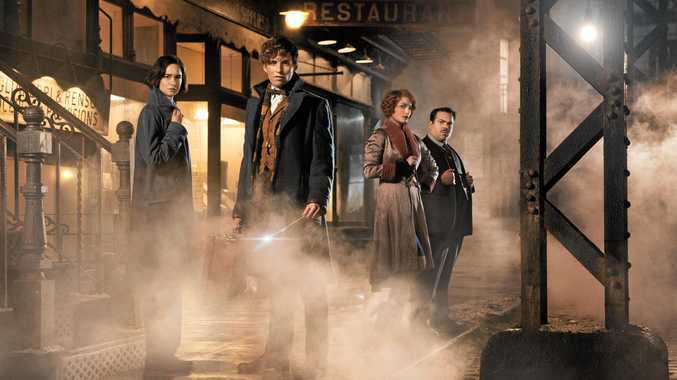 Warner Bros and Rowling have revealed there will be a total of five movies based on this series. The first film is set in New York City, 70 years before Harry's story started, and stars Oscar-winner Eddie Redmayne as Scamander. During his youth in 1926, Scamander travelled the globe to find and document all the magical creatures for the book but, during a stopover in New York City, a number of beasts are let loose by unsuspecting No-Maj (American for Muggle) Jacob Kowalski (played by Dan Fogler). Eddie Redmayne in Fantastic Beast and Where To Find Them. Former Auror Tina Goldstein (Katherine Waterston) and her sister Queenie (Alison Sudol) become allies to help find and capture them before the No-Maj population discovers the truth about witches and wizards. They are on the run from the Director of Magical Security, Percival Graves (Colin Farrell), who works for the Magical Congress of the USA (MACUSA). Speculation is rife about how this story can be sustained for another four movies, but fans will remember that the powerful dark wizard Gellert Grindelwald was gaining power in the 1920s and after wreaking havoc in Europe slipped away and could not be found. Percival Graves' poster has been shown with a curious necklace that fans will recognise as a symbol for the Deathly Hallows. Grindelwald, along with Albus Dumbledore, was seeking the Hallows in his youth. And just recently it was revealed actor Johnny Depp will star in the second film (with a small cameo in the first). Already fans speculate he will play Grindelwald. However, many have taken to Twitter to express their disappointment due to the recent domestic abuse allegations against Depp. Regardless of the furore, the addition of Grindewald will be an interesting way to tie the new series with the original Harry Potter events. Another promising aspect of this spin-off is that it's in the safe hands of director David Yates, who helmed four of the eight Harry Potter films including the franchise's epic two-part conclusion. We will finally get to see where it is all going and I am sure it will be magical. Stars: Eddie Redmayne, Colin Farrell, Katherine Waterston, Samantha Morton, Dan Fogler. Reviewer's last word: This spin-off offers an interesting departure for Harry Potter fans within the magical realm but in the very different surrounds of New York City in the roaring '20s. Quirky fact: Attended Eton College, where he had classes with Prince William. Best known for: The Theory of Everything, The Danish Girl, Les Miserables. Fantastic Beasts and Where to Find Them opens on November 17.